With the last race of the season a month away it was a great time to get a good race in. Anderson South Carolina is only a 1.5 hour drive from our new place in Atlanta and so it was a perfect place to test the training. I really wanted to see my progress at this race. I have been hitting the run really hard and maintaining my bike. I have also discovered a new pace when swimming. I now have a tempo-ish pace…which is better than my other do not die speed. We arrived the day before around 3pm and were able to get checked-in and scout our T2 area. T1 was a few miles up the road so we drove up and checked our bikes. This course sports the fun ‘clean’ transition at T1, meaning everything you leave behind must be bagged up. The volunteers drive everything over to T2 for pickup (they actually had mine dropped off at my bike). I do not mind it much at all. Race morning we woke up kind of late, I slept in an extra 15 minutes which is super unusual. I made some pancakes, we ate, we clothed, and were out the door on time. T2 was set first and went quick. When we jumped over to the shuttle there was a huge line, however the volunteer called us up as racers got priority over spectators. 🙂 Sweet. We made it to T1 in plenty of time and we were watching the starting waves in no time. Great pre-race! In no time I was suited up in my sleeveless wet suit and at the calm waters edge. The swim started fairly crowed. There was a lot of bumping and I went out too fast. My so called tempo-ish pace transformed into a sprint and I was out of breath. I tried for a few meters to keep pushing but still trying to calm my breathing. About 60% through the swim I caught my stride and was grooving through. The swim is in a lake and has you circle around a peninsula, so you are constantly swimming left. There were quite a few back strokers going sideways in this course. I had to move a few out of my way. Also a breast stroker was keeping pace with me. I still need to work on my swim. Time 29 minutes…right on pace. I had heard mixed stories about the bike course. It was hilly, it was helly, it was hellacious! But I had seen previous bike splits about an hour so it couldn’t be too bad. Well it was slightly more hilly than I wanted. The first 5 miles was a net up hill with nothing too steep. The middle of the course sported a few fairly steep small ring hills. I kept pushing and was passing a lot of cyclist. Especially some of the downhills. I hit 42mph max and averaged upper 30’s in a few spots. There was plenty of intersection control by the police, but we were still on open roads so there were still a few cars on the loose. Around mile 16 it almost ended, my left calf cramped massively. A car was on the course and was pacing behind some riders…riders I needed to pass. I slipped around the car and waved my arm out as I took off. Then bam…cramp. I stopped pedaling to stretch it and work it out. It took almost a mile to work it out to get back to speed. I downed another salt pill, chugged some Skratch, and gulped some more of my gel. It worked as the cramp did not return. One other odd thing that has never happened in a race before is someone was drafting off me for about 4 miles towards the start. I kept glancing back and they were riding real close to my rear tire. I slowed down, sped up, swerved to the left, to the right, he just kept drafting. I had no clue what to do. So I pressed on and eventually I was alone. Time 1:07 – Great considering the hills (~1,500ft of climbing) and the cramp. The run sucked. Actually I should clarify and say I sucked during the run. I started with a little side stitch from the start and just past mile 2 it was amplifying. I needed to control it. Luckily I was able to control it for the second half of the run after a gel and salvage my race. And it turns out that last kick bumped me to the age group podium. The course itself is hilly throughout. A lot of long uphills and downhills. Plenty of aid stations. The temperature was rising slightly but I was still able to cool my core temp. Just before mile 3 another racer passed by and I noticed his age group was the same as mine. Up until then I hardly noticed anyone’s age group. He had been trailing behind me for a few but my side stitch was having the better of me and he overtook me. I knew I had to stay on his heels or else it would be a lot hard to overtake him later. I paced behind him for almost a mile before we hit the most significant uphill of the course around mile 4. The gel was kicking in and my side stitch was subsiding and I felt good enough to push a bit at the start of the hill, so I did. I passed the other racer and I was able to keep a pretty good clip through the hill and was able to maintain a pace close to what I had planned for the whole run. As the finish line was in sight I checked back and saw a lot of space behind me. I still found the energy to give it one last sprint at the end. Time 44:30 – A good effort. I was happy with my time, and once I checked the results I was happier. As usual I was not first on the list, but I was second. The first place guy ended up with 1st overall which means that the age group 1st place went to me…I’ll take it every day. So with that, I was first in my age group, and it came down to some racing at the end of the run. That’s what makes it all fun. 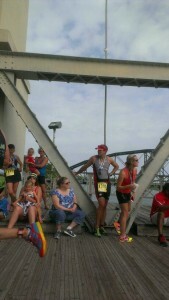 I had a great chat with the other age grouper afterwards and he had the same battle rolling through his mind. He got 2nd in the AG and got to the podium as well. 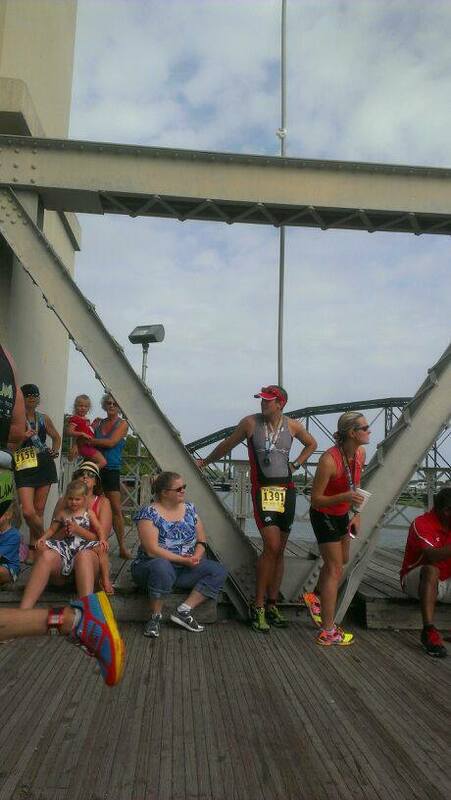 REV3 Anderson 2013 was a great race, 10/10, well supported, well organized, would race again. 2012 was a big year for us. We moved for the first time as a couple to San Antonio and decided we were going to find a way to get exercise to finally be a regular part of our life. Ed started with strength training and I got into about 10 hours a week of yoga, but something was still missing. We got this idea to do a Spartan Race from our friends and participated in the Spartan Sprint in Burnet, TX in May. It was fun and I was grateful to have a tall husband who could throw me over walls, but it still wasn’t quite what we were looking for on a regular basis. 200 m swim – 1:54, ok I really haven’t actually improved too much on this. 7:30 T1 transition (worst in the entire race)!! 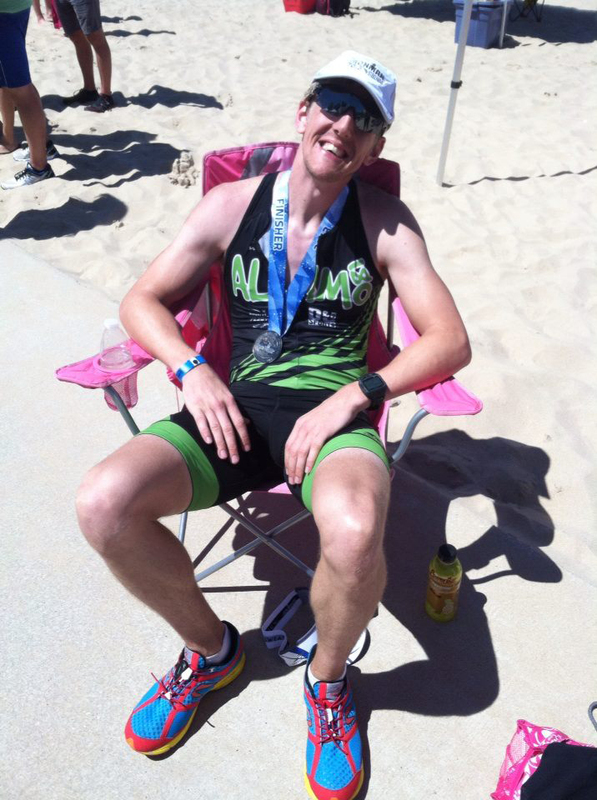 Included me peeling on bike shorts, putting on sunscreen and trying to leave transition without a helmet. 23:30 run (with camel bak on, knee started hurting .25 into run). Despite being terrible, we decided we loved it! We signed up for a TriWaco Sprint in July and since it was our first open water swim, found some swim lessons from Bree Soileau with Alamo 180. We thought she was awesome and the Alamo 180 team sounded awesome, so we joined up (me officially, Ed unofficially until 2013). It has been the best decision we could have made to improve quickly and have a blast doing it. Even though we only did half a season technically, we loved it and we are really looking forward to this season. We’ve already started the year with Half Marathons in January and we are training for our first Half Ironman in Marble Falls at the end of April! I look forward to sharing our challenges, successes, and other hilarious stories.